Massey Settles With 4 Miners' Families; Criminal Probe Continues : The Two-Way Massey Energy agreed to settlements with four families of dead miners as a criminal probe continued. Massey Energy confirmed Wednesday that it has reached settlements with at least four families of the victims of the April 5 explosion that killed 29 mine workers in Massey's Upper Big Branch coal mine in W. Va.
Massey declined to reveal details but as NPR first reported in April, the company offered $3 million to families that agreed not to file wrongful death suits. Three of the settlements were filed in circuit court in Boone County, W. Va, on August 11, according to court documents obtained by the Charleston Gazette. That was a little more than a week after Massey executives told selected family members that the mine disaster might have had a natural cause - a sudden and overwhelming blast of methane gas through cracks in the mine floor. A natural cause would presumably relieve Massey of civil liability and reduce the chances of successful lawsuits and larger settlements. But there was other news Wednesday that indicates any settlements based on that logic may be premature. NPR has learned that a federal grand jury is again meeting this week in Charleston, W. Va., as part of an ongoing criminal investigation of the disaster. At least two witnesses to a February incident involving the deliberate disabling of a methane monitor at the mine were expected to testify Wednesday. NPR has also learned that the February tampering incident is also the focus of some interviews this week that are part of a separate probe conducted by the federal Mine Safety and Health Administration and the State of West Virginia. Multiple witnesses have told NPR that a company executive ordered the disabling of the methane monitor and continued to run a mining machine without it. That's considered a dangerous and possibly illegal act because federal law requires the use of working monitors during mining. The monitors detect dangerous levels of explosive methane gas. A methane gas explosion is believed responsible for the tragedy. 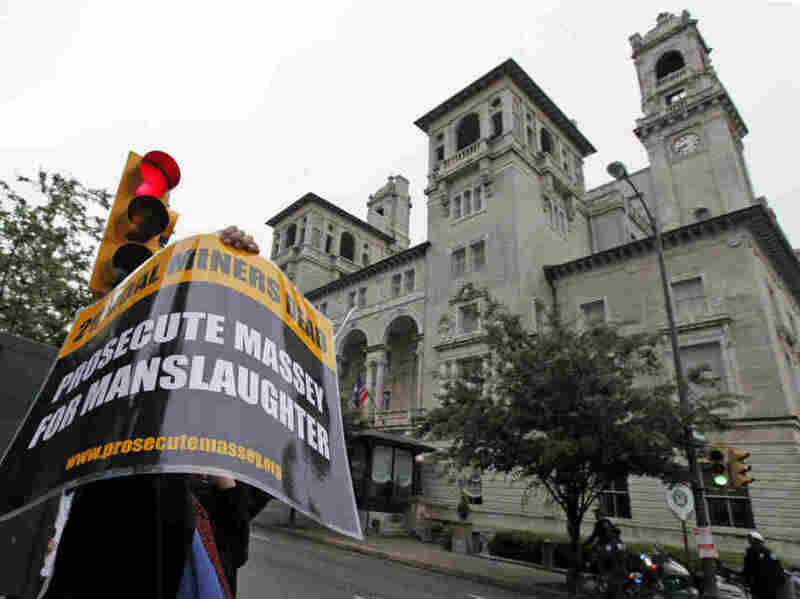 Any federal indictments involving Massey Energy and/or its mine managers and executives could put victims' families in a better position to negotiate higher settlements. Investigators have interviewed 197 witnesses and expect about 50 more interviews, which will include Upper Big Branch mine managers and executives. Investigators continue to search for methane monitors in the mine so that they can test for tampering. Flooding continues to hamper the underground probe in two key areas that are considered possible sources of the explosion, but the pumping out of water is expected to begin in one of those areas later this week. Investigators will return to a third area that is considered a possible source of the explosion to search for evidence that may be hidden by debris. Testing is finished on 1,800 dust samples which may indicate whether the mine was sufficiently protected against dangerous accumulations of coal dust. Coal dust feeds and exacerbates explosions and federal law requires measures that control the material. Additional dust samples must still be taken in the two sections now flooded. The update did not include any information about what investigators have learned or concluded so far.